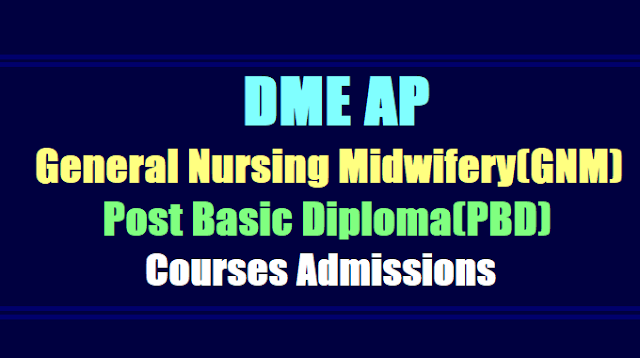 Eligibility Criteria for AP General Nursing and Midwifery & Post Basic Diploma Courses/Schedule of DME APGeneral Nursing and Midwifery(GNM), Post Basic Diploma(PBD) Courses admissions 2017/ GNM, PBD Courses admissions Online application form, Admission Notification for General Nursing & Midwifery & Post Basic Diploma Courses (Govt. & Pvt. Schools of Nursing) for 2017-2018. Online Applications from the eligible candidates (male & female) are invited for admission into General Nursing and Midwifery Course (3 years course including 6 months internship period) for the Academic year 2017-2018 batch which is being imparted in Government and Private Schools of Nursing in the state and Post Basic Diploma One Year Course in Government and eligible Private Schools (those completed APNMC inspection for PBDC) in the State for the year 2017-18. 8. Post Basic Diploma Course in Nurse Practitioner in Midwifery Course. recognized institutions conducting B.Sc(N) Course. 3. Possess a minimum of one year experience as a staff nurse. Refer WWW.IndianNursingCouncil.Org for admissions, fee structure and course details. a) 10+2 with English and must have obtained a minimum of 40% at the qualifying examination and English individually from any recognized board. Candidates are also eligible from State Open School recognized by State Government and National Institute of Open School (NIOS) recognized by Central Government. However Science is preferable. d) Registered ANM with pass mark. a) For disabled candidates: 3% Disability reservation to be considered with a disability of locomotor to the tune of 40% to 50% of the lower extremity and other eligibility criteria with regard to age and qualification will be same as prescribed for each nursing programme. Note: A committee to be formed consisting of medical officer authorized by medical board of state government and a nursing expert in the panel which may decide whether the candidates have the disability of locomotor of 40% to 50%. b) 5% of total marks is relaxed for SC/ST candidates c) Any other reservation as per the State Govt. Note: Reservation shall be applicable within the sanctioned number of the seats by INC and not above it. 3. Admission of students shall be once in a year. 5. Minimum age for admission will be 17 years. (as on 31st December of that year) The upper age limit is 35 yrs. For ANM/ for LHV, there is no age bar. Submission of online GNM admission applications and post basic diploma admission application: Online admission Application form is available in the Director of Medical Education, A.P., Vijayawada official website i.e.,http://dme.ap.nic.in and the same is available from 03.08.2017 to 01.09.2017. Follow the below given steps for submission of online Admission application. At any branch of State Bank of India at respective places. Step: 2: Log on to DME Official Website i.e., http://dme.ap.nic.infor online application form. Fill up all the mandatory fields ( * ) as per the instructions given in theonline application and press submit button. necessary enclosures as per the details noted in the application form. The downloaded applications should reach the Superintendents of the Hospitals concerned on or before 02.09.2017 by 5.00 P.M. The Department will not be held responsible for any postal delays for non-receipt of applications on or before the stipulated date i.e. 02.09.2017 by 5.00 PM. The local candidates belonging to the Districts mentioned under column 1 below should send their applications to the School of Nursing attached to the hospitals mentioned under column 2. • The detailed Notification & online application is available in the DME official website http://dme.ap.nic.in. • Every Superintendent will be provided with User ID & Password for verification of On-line applications received by them. • After selection of the candidates, they have to indicate the selected candidates through online. • Only downloaded online filled in applications along with Registration Fee and relevant enclosures have to be accepted. (2):-Selections will be made purely on merit, on the basis of aggregate marksobtained by the Candidates in the group subjects, excluding languages. • In deciding merit candidates who qualify under compartmental system will be placed after candidates who passed in a single attempt. (3):-Incomplete applications or applications submitted without attested copies of relevant documents will be rejected. (4):-The SC/ST/BC candidates should furnish the prescribed Caste Certificate given at attachment at Annexure - I signed by the competent authority not below the rank of Mandal Revenue Officer. (5):- 85% of seats in local area are reserved in favor of local candidates in relation to the local area and the remaining seats are un-reserved as per A.P. EducationalInstitutions (Regulation of admissions order 1974 as issued in G.O.P No. 646 Edn. (W) Dept., Dated 10-07-1979). (6):-Out of the seats available for admission - 15% for SC, 6% for ST and 25% for BCs are reserved. (7):- Waiting list with Ten (10) eligible candidates may be selected extra for waiting list for each Institution to avoid second time selection process. 1. Last date for payment of Registration fee is 01.09.2017. 2. Online submission of applications are from 03.08.2017 to 01.09.2017 for Govt. Schools and Private Schools. 4. Last date for submission of Downloaded applications is 02.09.2017 up to 5.00 P.M. for Convener Quota seats and 10.09.2017 up to 5.00 PM for Management Quota seats. 5. Selection process should be completed by 15.09.2017 for Govt. Schools and by 30.09.2017 for Private Schools by DM&HO. For further details, contact concerned Superintendent, Government General Hospital, attached with Government School of Nursing, in respect of Government Schools of Nursing, and contact concerned District Medical and Health Officer, in respect of Private Schools of Nursing. Detailed Notification & online application is available in the Director of Medical Education official website i.e., http://dme.ap.nic.in. The filled in applications of Post Basic Diploma Courses admissions to be submitted in the respective Govt. General Hospital/DMHO Offices by hand.